Easy to See, while also being the latest trend in Fashion Watches, OVERSIZED case with white dial and beautifully designed easy to read numbers along with index markers. 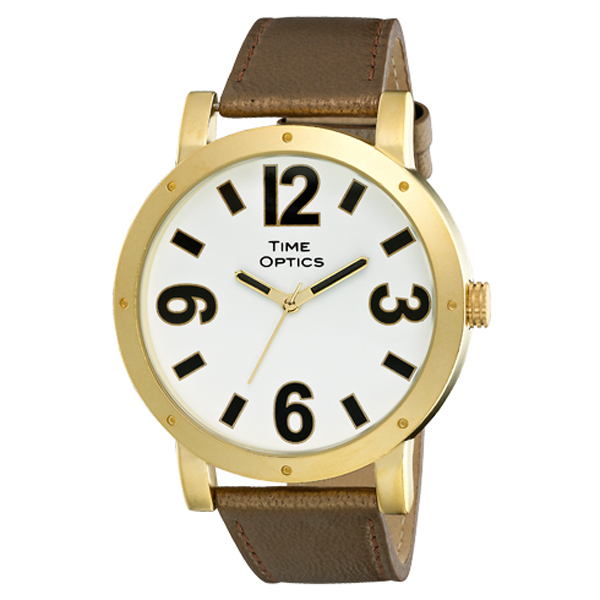 The watch has a Matte Gold Tone colored case with oversized crown. The Classic yet fashionable dial design with Bold Black numbers and index markers is beautifully adorned with our Brown Genuine Leather Strap in seasonable fashion! This is a high quality watch with the the latest technology in movements, components, and batteries. All of the Easy to See and Fashion Trend Watches never need winding and are 99.9% quartz accurate. All watches have a stainless steel back and mineral glass crystal. The Easy to See Trendy Fashion Series comes in a pouch and gift box with warranty.